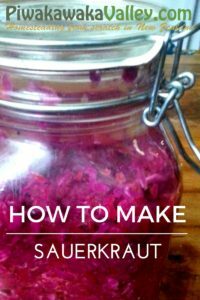 Why do I eat and make sauerkraut? I am a big believer in getting the things you need from foods rather than pills. 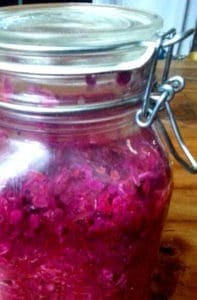 Making sauerkraut at home is super easy and the probiotics that it contains are so good for you. I also think we as a society are getting sicker and sicker due to our worsening gut health. Did you know that bacteria in our bodies outnumber our own cells to about 10 to 1? We are more bacteria than we are human. Gross. Haha, that totally weirds me out. Recent studies are showing just how much beneficial gut bacteria (your microbiota) play important roles in your body. They help with vitamin production, mineral absorption, detoxification, and helping prevent diabetes, digestive issues, neurological problems and cardiovascular disease. Your microbiota also plays a large role in your metabolism; sugar, refined carbohydrates and junk foods cause certain bacteria to release endotoxins. These drive inflammation and cause metabolic changes that result in overproduction of insulin, increased appetite, increased fat storage and obesity (1). Studies, where they have given fat rats the bacteria from thin rat’s, has caused the fat rats to lose weight and visa versa (2). One of the best ways to protect your health is by keeping your gut healthy by eating naturally fermented foods like sauerkraut every day. 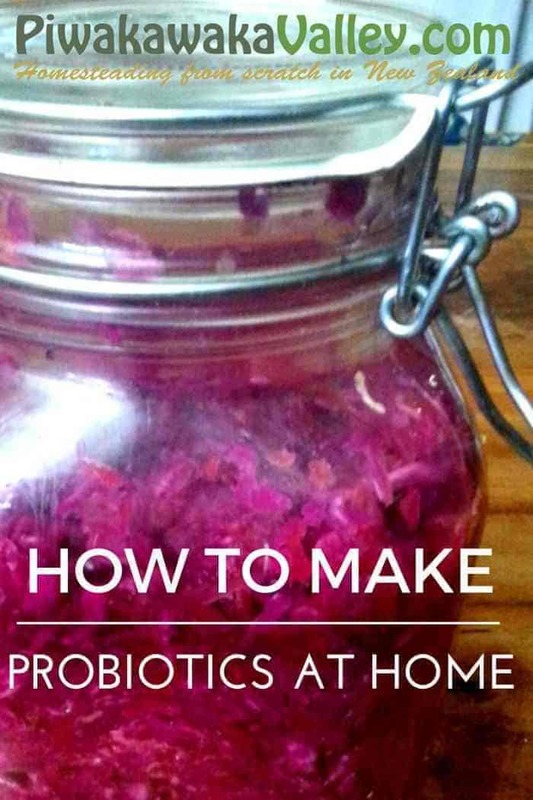 Probiotic capsules usually contain around 10 billion colony-forming units per capsule – a single 1/2 cup serving of fermented vegetables contain 10 TRILLION! 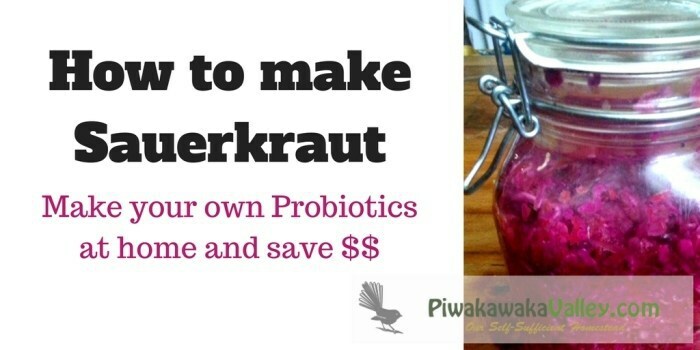 One serving of sauerkraut is like eating a whole bottle of probiotic capsules. 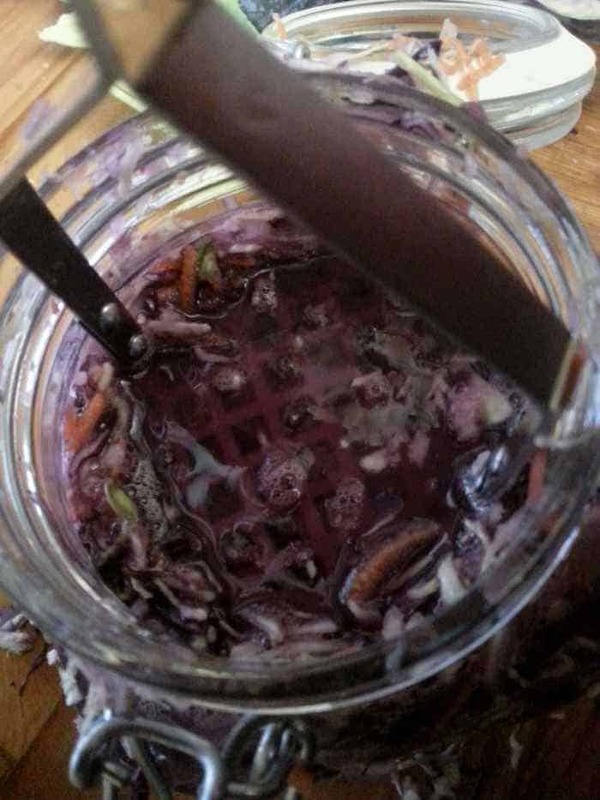 How does Natural Fermentation work? All organic fruit and vegetables, the dust on our soils, and all plant matter are covered with Lactobacilli. 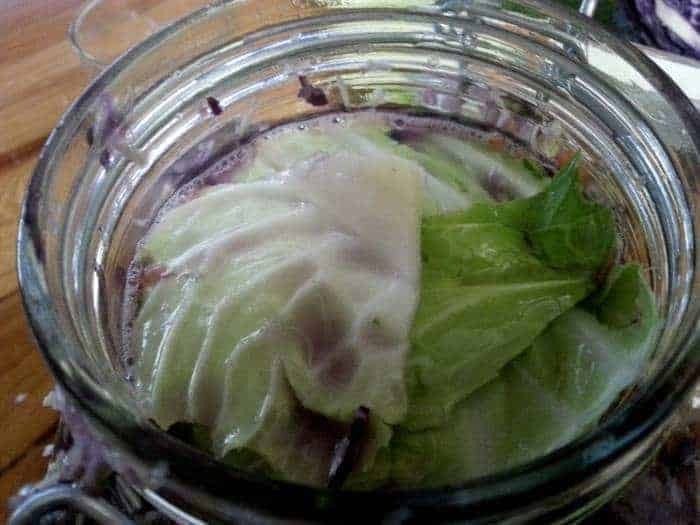 The fresh cabbage leaves will be covered in these lacto-fermenting bacteria. You don’t need to add anything to get this bacteria to work. Although some people choose to add some starter culture to ensure a larger range of bacteria. 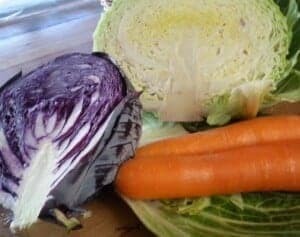 All you need to do is chop the cabbage up and add some salt in the initial stages to stop putrefactive bacteria from multiplying. Then as the Lactobacillus starts to work and they multiply, they produce lactic acid. That’s why they’re called Lactobacillus. If you look at the research in lactic acid, it is one of the most powerful antiseptics. It kills off lots and lots of bad bacteria and it will kill off all those putrefactive and pathogenic microbes and preserve the food. Lactic acid is a great preservative. A good batch of sauerkraut can keep for five to six years without spoiling or rotting, as long as it is covered by its own juice (3). To make enough for a 2-litre (2 quarts) jar of sauerkraut I used 2 large carrots and 1/2 a large green cabbage and 1/2 a small red one. 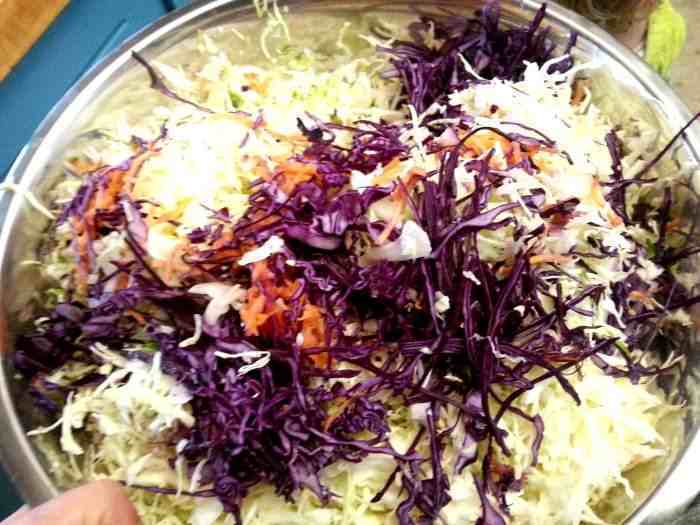 Finely grate/chop or shred your vegetables to the consistency of coleslaw. 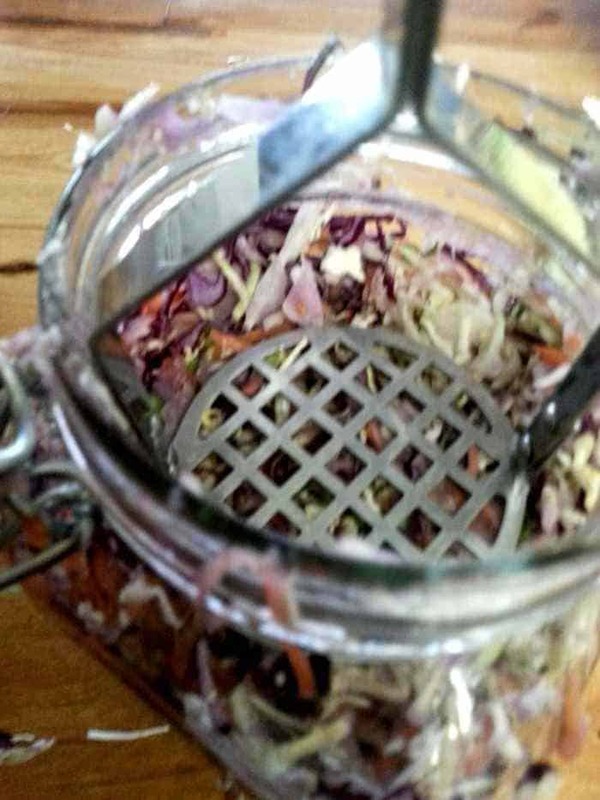 I throw them all through my food processor – using the grater blade for carrots etc and slicer blade for the cabbage. Put them all in a large bowl and with clean hands, add 1-2 teaspoons of salt and mix thoroughly, squeezing as you go. Sit aside for 30-60 minutes and the salt will start working some of the juice out of the cabbage. If you choose to use a started culture, add it now dissolved in 1/4 Cup of cold water. Start packing the sauerkraut mixture into your jar, stopping at about half full to squish down with a potato masher or wooden spoon and again at 3/4 full. Keep adding more sauerkraut mix and squishing it in. Keep adding more sauerkraut mix and squishing it in. The aim is to get all the air out and get the top submerged in its own juices. Once you are near the top, use a piece of an unused outer leaf of the cabbage to cover the top and help keep the shredded sauerkraut mixture below the juice. You can hold it all submerged with a small glass jar that is filled with water as a weight. Sit at room temperature for 7-10 days. Start tasting it daily, when it is pleasantly sour you can pop it in the fridge to stop it souring further. You can leave it totally unrefrigerated if you like. But it will become increasingly sour, and if you like it that sour – go for it. The sauerkraut will have more beneficial bacteria in it the sourer it becomes. When you start eating probiotics like sauerkraut you can cause a ‘die-off reaction’ in your gut. This is from all the bad bacteria being killed off resulting in an upset tummy. I suggest you start with just 1-2 teaspoons per day and slowly build up to 1/4-1/2 cup one to two times per day. 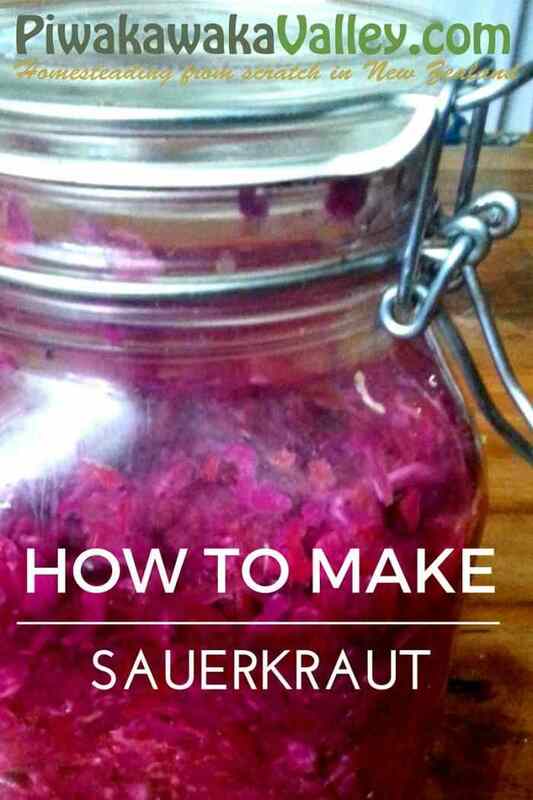 Do you make sauerkraut at home? What is your favourite flavour combination? Hi EW, yes I do ferment them in those jars, I do usually leave the lids closed but unclipped while they are fermenting as the gas builds up fast. You can clip them closed but I found I had to ‘burp’ them two or three times a day. I clip them shut once they are in the fridge though.